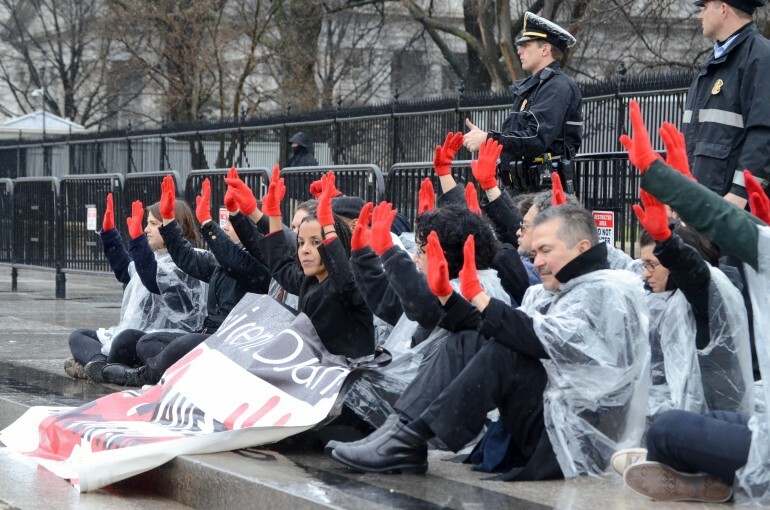 Police arrested anti-deportation on Tuesday in front of the White House in planned acts of civil disobedience. Wearing red gloves and congregating in front of the fence that separates the White House grounds from Pennsylvania Ave, protesters chanted and held a sign saying “President Obama, you have blood on your hands” and “stop the raids.” The Obama administration has faced increasing pressure from Democrats and human rights activists in since December, when news leaked that ICE would conduct raids on self-identified refugees from Central America. Citing that an estimated 83 Central American migrants similar to those being targeted by the administration have been killed, the protesters paraded crossed in front of the White House. Pictures from Reuters and immigration activists show the protesters parading crosses. In a statement, Fair Immigration Reform Movement (FIRM) spokesperson Kica Matos explained the symbolism. “Look around you, and you will see 83 crosses. These crosses stand for 83 immigrant deaths that took place in 2014. All 83 immigrants came here to escape the terrible violence taking place in their home countries,” she said, according to quote provided by from Center for Community Change, an immigrant activist group. The 83 number appears to reference these media reports. Matos was one of 14 protesters arrested from the small crowd, according to the CCC. Reuters reports confirm that various immigration protesters were led away from the White House fence in handcuffs on Tuesday. It is unclear what they are being charged with. The Obama administration has defended the deportations of newly arrived Central American immigrants, arguing that many have exhausted their legal options and are not deserving of refugee status. In a January statement, DHS Secretary Jeh Johnson said that the raids would continue, despite significant protests from Democrats in the senate. "Our policy is clear: we will continue to enforce the immigration laws and secure our borders consistent with our priorities and values," Johnson said. "At the same time, we will offer vulnerable populations in Central America an alternative, safe and legal path to a better life." Immigration activists insist that the administration is morally responsible for any of the deported who are murdered after their deportation. “Instead of welcoming them and giving them the protection that they so desperately needed, our government arrested them [....] If the raids and deportations continue, President Obama will be responsible for the possible harm or even death of hundreds of thousands of innocent people. Their blood will be on his hands,” Matos said.